Shelby, Montana is a station stop for the Amtrak Empire Builder in Shelby, Montana. Near U.S. Highway 2, the station is adjacent to downtown Shelby. The station, platform, and parking are owned by BNSF Railway. 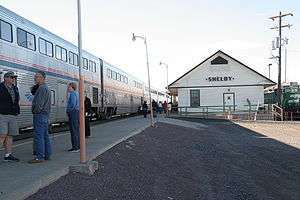 Shelby is a smoke-break stop for the westbound Empire Builder, with continuing passengers allowed to step off the train at Shelby. Due to "padding" in the westbound schedule, if the westbound Empire Builder is on-time into Shelby, the stop in Shelby can be as long as a train service stop.